Without a doubt, this gaming chair falls within our top 10. Available in full black and white. Extremely high end, high quality, most luxurious executive office gaming chair include LED multi-coloured flashing lights and Bluetooth surround sound Dual speakers. This really is the ultimate gamers chair. There are many places to by cheap gaming chairs which is trounced by the Y-3000 Alien Gaming chair made by EarthCroc. You can find gaming chairs from many websites like Overclockers, DXRacer, Maxnomic, Amazon, eBay, Box.co.uk, BoysStuff.co.uk, noblechairs, Nitroconcepts, Arozzi, AKRacing, Vertagear and even Tesco. The point is, you can find chairs everywhere, but none that compare to this beauty. It retails for £649.99 so is certainly more for someone who uses the chair daily, or just wishes to make the room look more luxurious. EarthCroc are the innovaters of gaming. You can find another review or other reviews elsewhere about this product. Possibly the World’s most expensive gaming chair, but well worth the purchase. It is available for shipment Worldwide. This entry was posted in Category 1 and tagged AKRacing, Amazon, Arozzi, Box.co.uk, BoysStuff.co.uk, DXRacer, eBay, maxnomic, Nitroconcepts, noblechairs, Overclockers, reviewinsider.co.uk, tesco, vertagear on 30/06/2016 by EarthCroc Ltd.. The Y-2899, inspired by the colours of the Italian flag, has now be revealed. The Y-2899 features a high back to allow comfortable headrest and slanted armrests to avoid uncomfortable arms when resting your hand and elbow between a desk and the arms of the chair. Once every week, we will be revealing one of our many models coming in for November. Keep an eye out or like us on Facebook for notifications! This entry was posted in Category 1 and tagged DXRacer, http://www.argos.co.uk/static/Browse/ID72/33014226/c_1/1category_rootTechnology33006169/c_2/233006169Video+games+and+consoles33008137/c_3/3cat_33008137Gaming+chairs33014226.htm, http://www.boysstuff.co.uk/gaming-chairs/, http://www.game.co.uk/en/endless-range/gaming-chairs/, http://www.gtomegaracing.com/gt-omega-racing-gaming-office-chair-seats, http://www.pcgamer.com/best-pc-gaming-chairs/, https://www.overclockers.co.uk/productlist.php?groupid=702&catid=2804, maxnomic, needforseat, www.milandirect.co.uk/Office-Chairs‎, www.officefurnitureonline.co.uk/‎, www.wantdontwant.com/Office-Chairs‎, Y-2899 on 27/09/2015 by EarthCroc Ltd..
EarthCroc Ltd. sponsors of IGN Romania Ltd., delivered 6 chairs, 3 yellow striped and 3 white/red/black. The chairs codes are Y-2844 & Y-2860. Y-2860 (white/red/black) has proven to be an extremely popular model selling hundreds in just a couple of weeks and quickly being sold out. This model along with several new models will return mid November to stock. Stay tuned for their review and visit their Facebook page. This entry was posted in Category 1 and tagged counter strike, dota, dota 2, DXRacer, gaming chair, heartstone, league of legends, maxnomic, office chair on 11/09/2015 by EarthCroc Ltd.. When I came across the Gaming Chairs offered by EarthCroc, I was pleasantly surprised by the great choice of colours, which were absolutely necessary for picking a gaming chair. Although they may not offer a huge variety of chairs, I found this company is all about quality over quantity. Much to my astonishment, the gaming chair from EarthCroc was nothing short of outstanding in terms of comfort. I found it to be the perfect seating device an avid gamer! 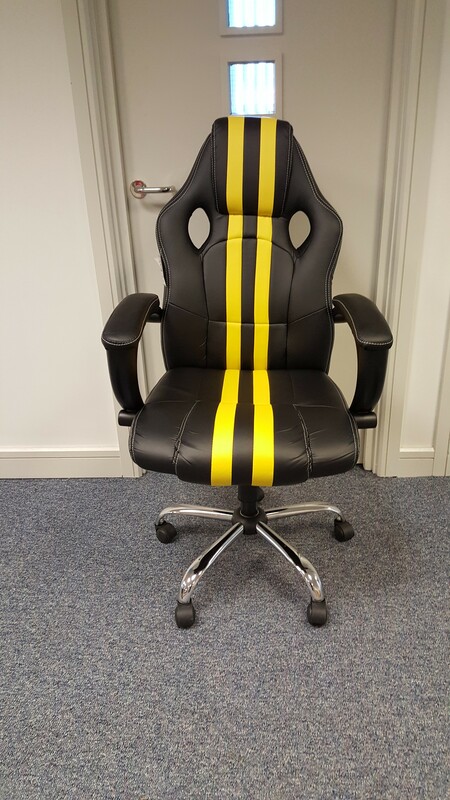 Noteworthy points of this gaming chair is the great combination of colours, I love the bright yellow contrasting with the black and think it looks really good. Even as a replacement for an office chair, this adds a kick of colour and is tons better than a bland black office chair. The EarthCroc Gaming Chair stands out due to its modern design, which, after sitting on it, has been clearly implemented for comfort. The chair has an almost ergonomic feel to it, making it very comfy for my lower back. This meant I could lay back and play on the PS4, or sit forward and do some PC gaming. I’m quite big, so I was happy to see some adjusting options, allowing me to sit in the chair comfortably. When sitting at a desk, my elbow rests on the arm rest when using the mouse, allowing for a much more snug seating arrangement. 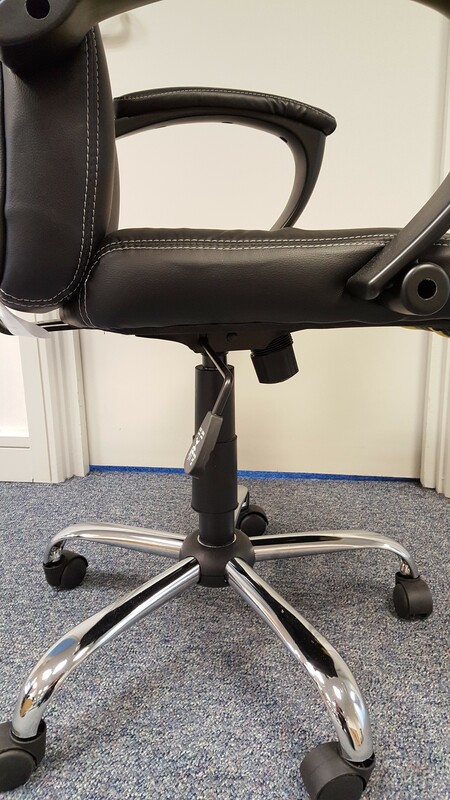 But what I think really puts this particular gaming chair ahead of standard office chairs is the high quality of materials used. The middle of the seat is fabric covered with mesh, this is great as it provides ventilation to my back during the entire time I am sat on the chair. This is a huge plus for me, as in the summer months, sitting on a non-breathable chair can get quite uncomfortable. As mentioned the height of the chair is adjustable, so whether you’re short or tall, you should be able to sit comfortably either way. The seat though spacious, may not be able to accommodate individuals with slight weight issues, so to speak. For me the only drawback is that its a little small for my size. That’s no blame on EarthCroc, my thinner colleagues all sat in it perfectly. It just would of been better for me, if it was a little bit taller in the back, and bit wider in the seat. 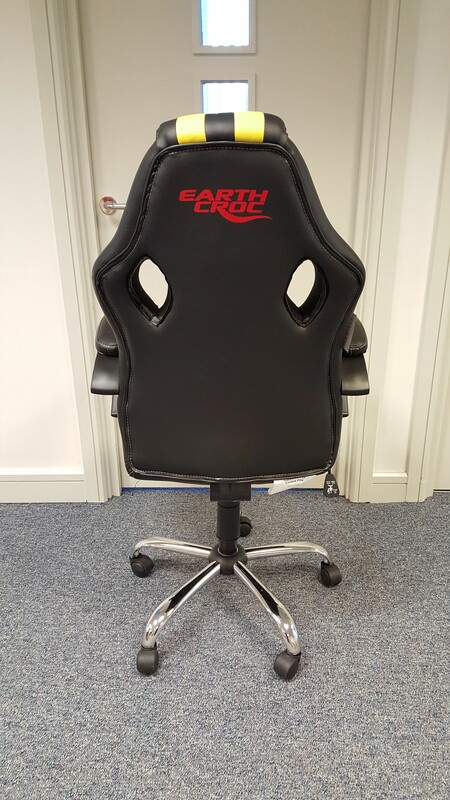 I consider the EarthCroc Gaming Chair one of the better gaming chairs for around £80. The chair will keep you comfortable all day long, and the padding won’t become flat, as seen in cheaper products. They offer a number of different colours and styles, and the shipping was next day, so thats a massive bonus. 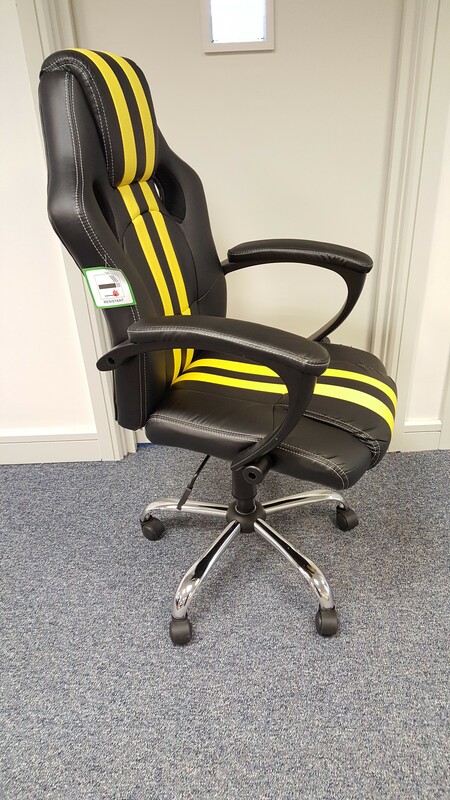 Currently I am the envy of the office, while everyone has their black dull chairs, I’m racing around in my yellow and black gaming chair from EarthCroc. This entry was posted in Category 1 and tagged buy a cheap chair, buy a gaming chair, comfy chair, desk chair, DXRacer, ergonomic chair, office furniture, racing chair on 10/09/2015 by EarthCroc Ltd..